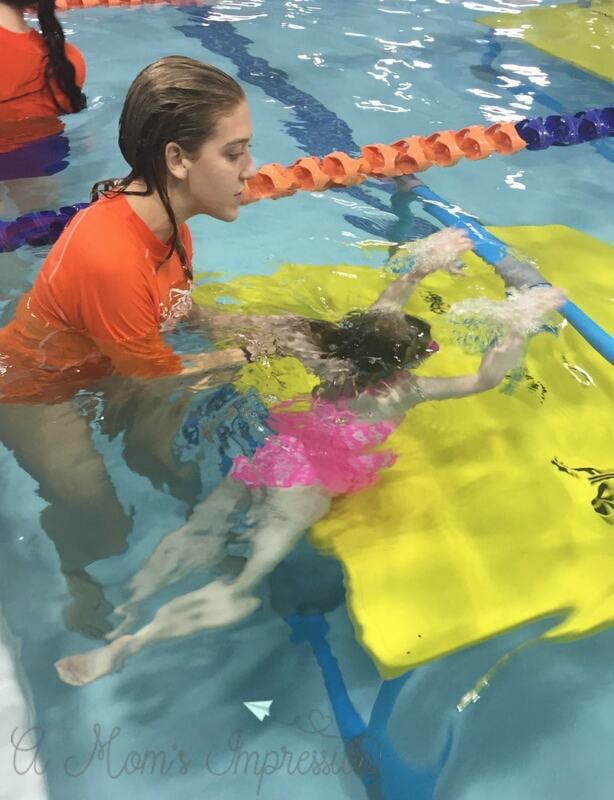 We partnered with Goldfish Swim School for Indoor Swim Lessons for Kids to facilitate this post. All opinions are 100% mine. I’m not sure I have seen the sun much more than a few minutes since November. This has been a very interesting winter so far here in Indianapolis. While it hasn’t been particularly cold or snowy, it also hasn’t been ideal to get out and play a lot. 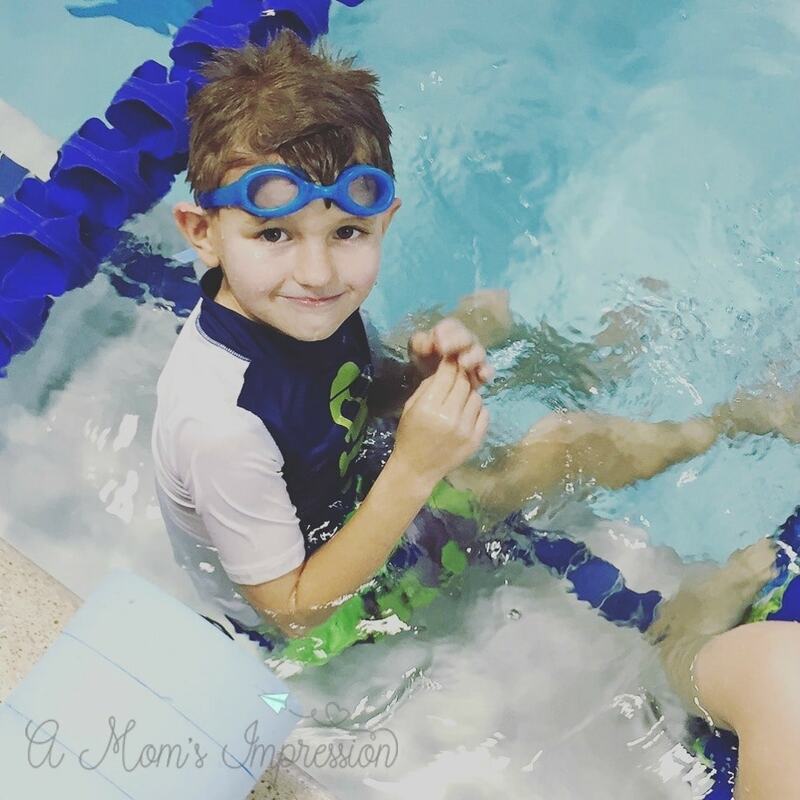 This is why indoor swim lessons for kids is such a great idea! 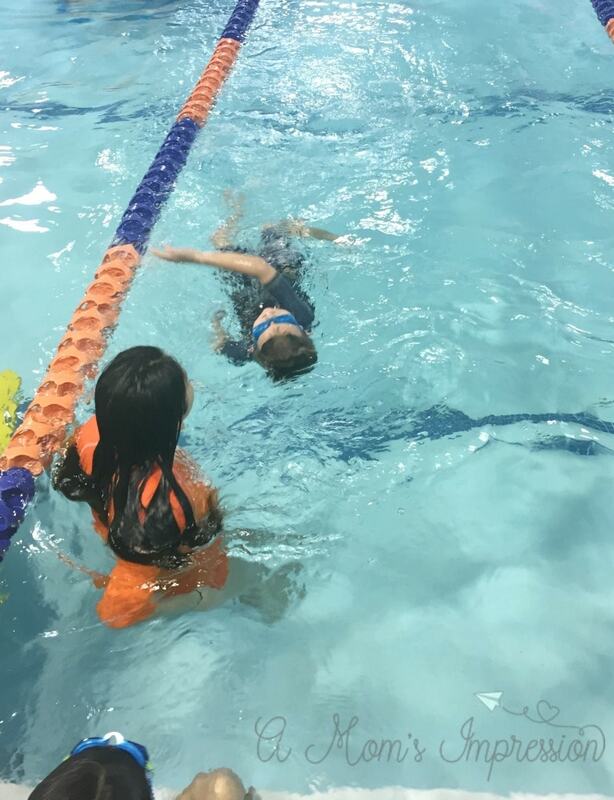 We have been swimming every weekend at our local Goldfish Swim School to keep active and to help ensure a safer summer swim season at the neighborhood pool. Teaching your child to be safe around water is a high priority for any parent. I read somewhere that about half of the people living in the US are afraid of the deep end of a pool. What more reason to make sure that your child is comfortable in the water. Somehow Caroline has become a bit scared about getting her face in the water. I think we allowed her to be in her floaty for a little too long and now she has become dependent on it. She loves to be in the pool, but she doesn’t want to actually swim. We realized that if we are ever going to have that magical day of just lounging outside the pool, sipping on a beverage and watching our kids play in the water without us, we were going to need to get her into some swim lessons. 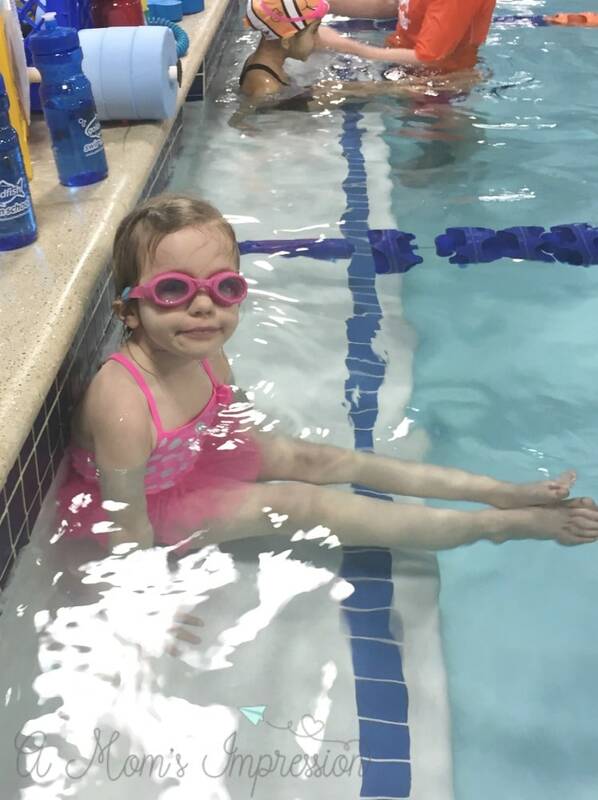 Indoor swim lessons were the perfect fit for us. If we can get her comfortable swimming now, in the winter, hopefully when the summer rolls around she will be willing to play with her neighbors in the pool without her floaty. 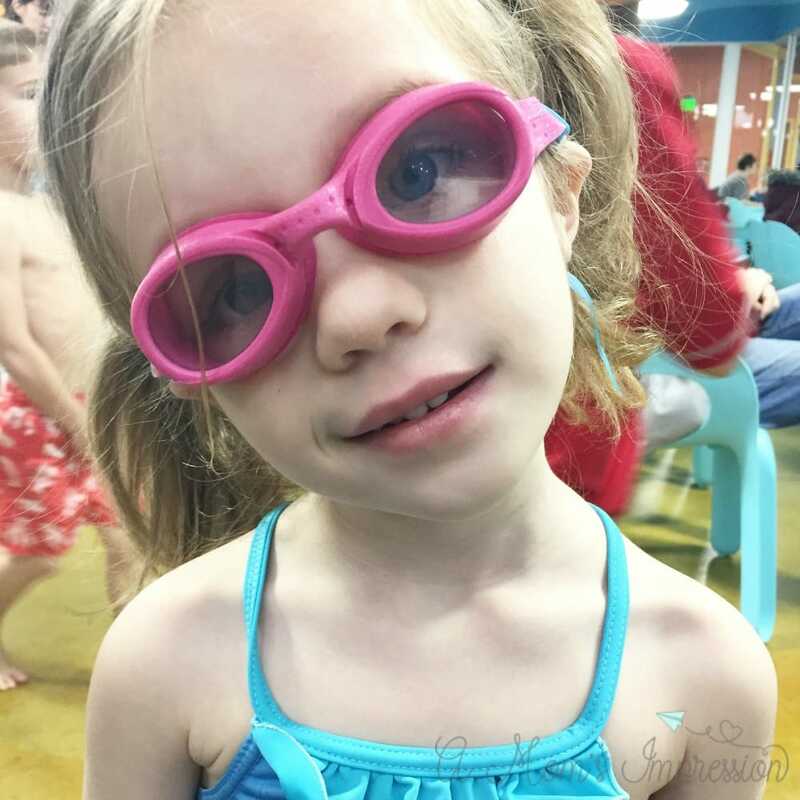 Luckily finding indoor swim lessons for kids was easy thanks to Goldfish Swim School. Goldfish Swim School has two locations in the northern Indianapolis suburbs. There is one located in Carmel and one located in Fishers. We love our Fisher’s Goldfish Swim School! This is the second time we have taken lessons from this particular location and have been very happy with our experience. The first time we took lessons Caroline attended the toddler/parent swim lessons and Jonah was just a beginner. Fast forward a couple of years and now Caroline is in the beginners class and Jonah is doing some intermediate swimming. Goldfish Swim School looks at their accomplishments and sets goals for kids in order for them to move up in their classes. Caroline is working on putting her face in the water and reaching out when she swims. The fact that on her second lesson her instructor got her to go under the water is remarkable. We have been thrilled with the progress she has made in 3 short weeks. Jonah is pretty good swimming under water. The goal for him is to be comfortable floating on his back and doing the back stroke. He has been practicing hard and is making slow progress! Goldfish Swim School facilities are top-notch. They have plenty of changing rooms, hair dryers and even a suit dryer/spinner thing for your convenience. Parents are able to watch their children swim from the other side of a wall of glass. This separation allows the kids to be able to hear their instructors and giving parents an opportunity to sit in a quite place…even if its just for a few minutes. Safety while in the water is crucial and Goldfish Swim School takes it seriously. In addition to the small class sizes (4 to 1 or private classes) there are several lifeguards standing near the classes. When my daughter practices how to climb out of the pool, they call a lifeguard over to stand right over them while having the instructor in the water. I feel 100% confident that my kids are safe. We will be posting about our kids’ progress over the next couple of months, so please be sure to come back and visit. 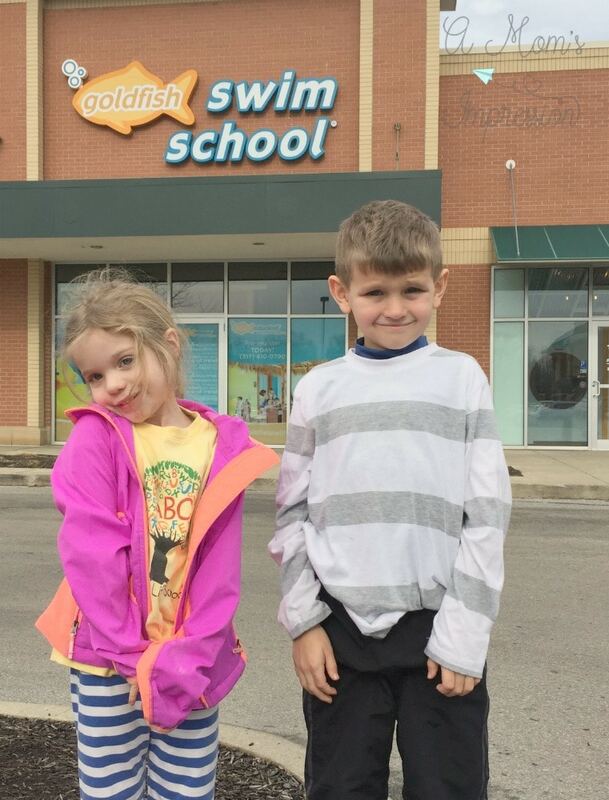 For more information about Goldfish Swim School in Fishers, Indiana be sure to visit their website. Come on over and check it out, you will be amazed at how different and special swim lessons can be!